A ML5.5 earthquake occurred at 1:57PM on August 26th, 2012, and was preceded by nearly 200 events ranging ML1.4-ML5.3. The swarm began on Saturday evening with six events of M<2.0, and activity picked up at 8:30 am today with three M2.5 events in a few minutes. As of 12:00 pm on 8/28/12, CISN recorded more than 550 events. The largest two are M5.3 at 12:31 pm and a M5.5 at 1:57 pm. There have been eight events ranging between M4.0 and M5.0, and a total of 57 events M 3.0 or larger have occurred (for the list of M3 and larger events, see below, for a complete list of events, navigate to http://www.scsn.org/2012BrawleySwarmList.html). The earthquakes are occurring on a northeast striking fault zone located about 6 km north of the northwest end of the mapped Imperial Valley fault. This is within the area called the Brawley Seismic Zone. The BSZ extends from the northern end of the Imperial fault to the southern end of the San Andreas fault. It has been characterized by swarms that have occurred in the 1930s, the 1960s, and 1970s. 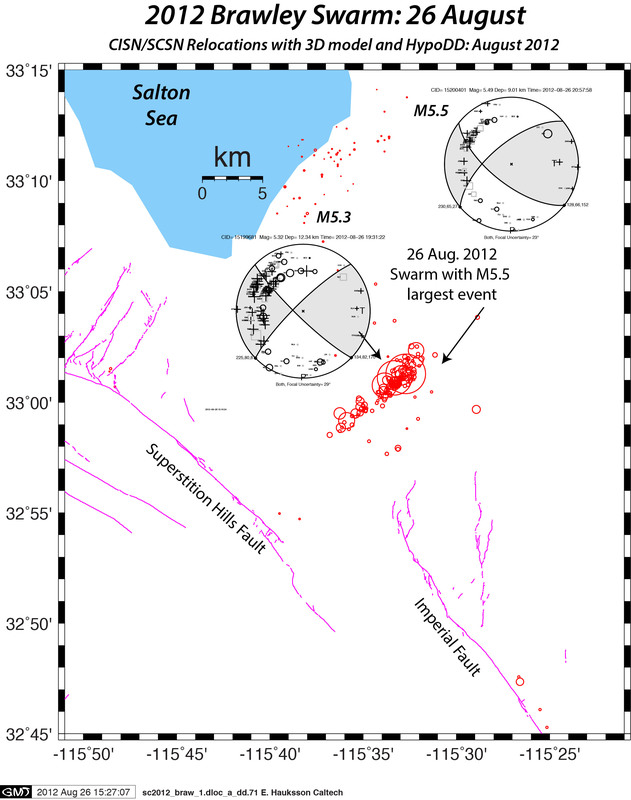 The last significant swarm before this one occurred in 2005 along the south shore of the Salton Sea, with the largest event of M5.1. In 1981 there was swarm-like activity called the Westmoreland sequence, with a largest event of M 5.8, which occurred 5 miles (8 km) to the northwest of today’s activity. Some of the aftershocks of the Mw6.4 1979 earthquake occurred in the same general area. In the 1960s and 1970s, the southern part of the BSZ was very active. 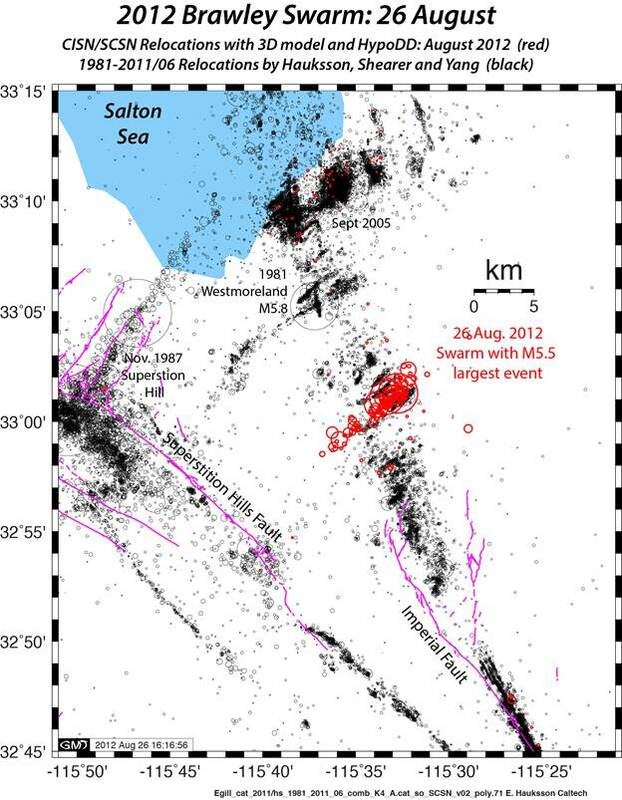 Several swarms included many thousands of events, but with a largest magnitude of only M5.0 or less. From 1981 to 2000, the Brawley Seismic Zone was quiet. In the last decade several swarms smaller than today’s were recorded in the northern part of the zone. A field visit on 8/27/12 found no evidence of surface rupture, nor evidence of liquefaction. It would be surprising to find such earthquake phenomena associated with events of this magnitude, as surface rupture usually accompanies larger events with shallow depth. Expected future development of this activity: In the past these types of swarms have continued for many days. Previously, events of up to M6.2 have occurred on northeast striking cross faults, but bigger events are possible on the major northwest striking late Quaternary faults in this vicinity. Hauksson/Shearer 3D Relocations, Demonstrating a NE Striking Trend. Both M5.3 and M5.5 Events Display Left-Lateral Strike Slip Motion Along a Strike the Sequence Follows. b-Value (cumulative number vs. magnitude) as of approx. 3 pm. The b-value of 0.7 is low compared to the expect value of 1.0 for southern California.